Here are the highlights of my 2018 travels in chronological order. Every place I stayed also has a Pet-Friendly-Report . I said good-bye to family and friends in Sacramento, CA on June 23 and headed south. I followed route I-40 and Route 66 to visit my son in OKC. Then continued on to tour the south, ending in Myrtle Beach. On Nov. 12, I left Myrtle Beach to return to Sacramento, CA for the thanksgiving holiday. I have had my small Class C motorhome for two years prior to going full time but the longest we had used it at a time was 6 days. My biggest concern living in it full time and putting so many miles on it was maintenance. Wear and tear is a consideration, as well as engine and tire maintenance. I paid $300 for a mobile RV service to give me an oil change while in Myrtle Beach and I spent $200 on an air compressor and parts so I can service my tires myself because it was getting difficult to find places. Needles River Road RV Resort, Needles, CA — stayed one week including over 4th of July holiday. Had no idea how hot it would get. Over 100 most of the time, up to 107. Kitty took 2 days to get acclimated before he wasn’t panting all the time. Seligman KOA, Seligman, AZ — This is a great place to do the Route 66 thing but, other than getting a take-away at a restaurant, we stayed at the KOA. There were tour busses letting people off at some of the souvenir shops. Meteor Crater RV Park — took a tour of the crater, lots of parking and plenty of room for the motorhome. Then back to the highway to check in to the RV Park. Winslow, AZ — Standing on the corner, naturally! Route 66 RV Park and Casino, Albuquerque, New Mexico — brand new and they take the Route 66 theme to heart. 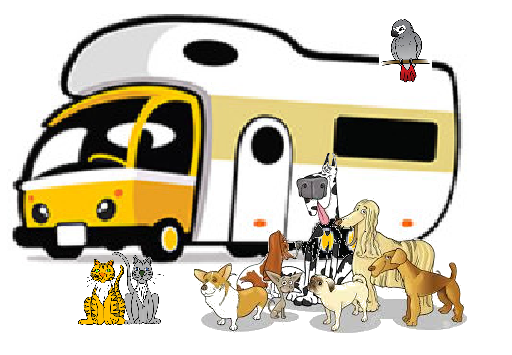 Very dog friendly — 3 dog parks and a free dog wash.
Cactus RV Park, Tucumcari, New Mexico. Inexpensive and fun. I was here for 4 days. Lots of stores and restaurants to visit. The Texas Panhandle was interesting. I missed my stop so decided to keep going. My first time without a reservation. Spent the night at Lone Star RV Park in Shamrock, TX. Stopped at the Route 66 Museum in Clinton, OK. One night at Elk City KOA, then on to see my son. Made it to OKC, Oklahoma and my son and daughter in law’s house. Stayed at Road Runner RV Park for 2 weeks. It was very hot, many days over 100. Highlight — visiting the memorial museum and riverfront with my son. Had reservations in Texas so I found one stop on the way down so my drive wasn’t so long — Hidden Lake RV Park, Ardmore, OK — the lake was actually just a man made spot between the freeway and some tract homes but it was ok for one night. 5 nights at Lake Tawakoni, Thousand Trails Resort. We had a pretty good time here. The weather wasn’t awful, the spaces were large, and there were many hiking and exploring opportunities for me and the dogs. Highlight — saw an armadillo and found a box turtle (we didn’t keep it). Our first long stay, 2 weeks at Escapee’s Rainbow’s End in Livingston, Texas. I had been looking forward to this because this is where my mail forwarding service is and I was also actually planning to change to Texas domicile from California. The tour of the mail service facility was fascinating; I think they have about 10,000 clients and we each have our own street “address.” Decided to keep the California domicile so didn’t do much while here but drive my electric bike around, go swimming, walking the dogs, etc. And had my first meet-up with a FB acquaintance I had never met in person before. Was very excited to make my way to Galveston Island after this. I had never been to the gulf before except for a brief Florida trip when I was about 12 (48 years ago!). There are many choices on Galveston Island and I booked a place that looked very expensive but was running a special. I paid about $300 a week for 2 weeks and stayed at Stella Mare RV Resort. The best part of this whole stay was that we were across the street from a really nice free “pocket” beach that we visited almost every day. The dogs and I were very surprised to find the water so warm and inviting. During this stay, I also made a new friend who is also a woman solo traveler and we have since kept in touch. In retrospect, this is one of the places I would definitely go back to in the future. After leaving Texas, I was now visiting states I had never been to and I had some interesting adventures. I’m fortunate that everything always worked out for the best as I explored uncharted territory. If I was going to make one comment about Louisiana, it would be THE FOOD! I booked two nights at Johnson Bayou RV Park mostly because I had read a book that featured Johnson Bayou but when I got there I changed my reservation to one night. It wasn’t really a “traveler’s” park and there were mucho stickers that the dogs weren’t used to. I was able to add one more night to our stay at Cajun Palms RV Resort. This resort is the Animal House for the senior set. It was definitely party central, from the swim up bar, live entertainment and a casino to four liquor stores on site. It wasn’t awful but I felt like I had to walk out to the back 40 where there was current construction of new cabins to feel comfortable walking the dogs. If you want to bbq and rabble rouse with your friends for a weekend, this is the place to go. If you want a quiet setting to walk your dogs in nature, this is not the place to go. Highlight — I walked over to the Dinosaur attraction and then had a fantastic lunch at a little cafe next door. Best catfish bites I’ve ever had. There are also several restaurants that deliver right to your motor home. By far, the best state parks we stayed in were in Mississippi and Georgia. Our next stop was 5 days at Percy Quinn State Park in the southwest part of Mississippi. I would definitely stay here longer if in the area again. All the sites were full hook up and several sites were monthly. I was right on the lake and had no neighbors. Even the cat enjoyed coming out on his harness and taking in the ambiance. And we had our first experience hiking on extended boardwalks through the bayou. On the way to our next stop, we detoured to Rosedown Plantation in St. Francisville, LA. I would definitely recommend taking one of these tours and many of the sites are dog friendly. I don’t recall the reasoning now, maybe the weather, but I ended up extending my stay at the Meridian, Mississippi KOA to 10 days. We had a relaxing, enjoyable time while here. Giant water slide at this KOA that I did not try it out. We were here over Labor Day weekend. Next was a state park in Georgia called Chattahoochee Bend State Park. Due to Hurricane Florence, I cancelled a reservation closer to the coast and we stayed here for 11 days instead of the original 5. Although not full hook ups, the dump station was nearby and we managed fine. I met another new FB friend while here who was the campground host for this season. Highlight — miles of hiking trails through the woods and along the river. The dogs really enjoyed it. We walked about 10,000 steps a day or more. Traveler’s Rest KOA was a quiet, comfortable 5 days. We walked over to an antique store and did some shopping in the KOA camp store. The owner’s teenage son detailed the RV, $3.00 a foot. After Traveler’s Rest, I was looking forward to a whole month at an RV Park made for dog owners with lots of activities. But after picking up our mail from the General Delivery in Rutherfordton, North Carolina, I went to check in and was just not happy with the whole arrangement. I couldn’t see us there in the spot they gave us for a whole month so I left. Now I had no reservations and had to think fast. I ended up spending the next month going back and forth between North and South Carolina until my reservation for Myrtle Beach was ready. On our way to Spartanburg, we stopped at Cowpens National Battlefield. Historical and interesting. I bought a few little books and dogs were allowed on the trails. The rest of September was spent at Spartanburg KOA in South Carolina. I was actually very impressed with this KOA and glad I had changed my reservations. We had a deluxe patio site and enjoyed the walks through the woods and the ponds while we were there. Not too far away, our next stop was Croft State Park. Also enjoyable in a different way. I ended up moving to a new spot on the second day only because it was less isolated and there was better cell service. Met up with another traveling solo woman friend. This is a “horse” camp and on our last couple days, a bunch of horse trailers pulled in for a weekend show. Fun. They also have a gift shop in their little office. A nice nature getaway close to the city for people who live in Spartanburg. After Croft, we spent 5 days in North Carolina at Statesville KOA. Not as impressed with this one and we even left one day early. It was ok and there is a large dog park, although it was a major walk from where we were parked. I had one day before our reservation at Andrew Jackson State Park and it turns out, Case Creek State Park, although in another state, was only a few miles away and had availability. I guess if you have to be somewhere during a hurricane, this was as good as any place. We happened to be there during Hurricane Michael. I didn’t even hook up anything except the electricity and the dogs really didn’t want to go walking. We were there a very short time but I’m sure it’s a lovely park with the locals during the summer months with a large beach and woods for hiking. I had been looking forward to Andrew Jackson State Park and we were not disappointed. There are only 3 full hook up sites but we got one. The sites are kind of tight and it filled up on the weekend but otherwise, was not busy and quite pleasant. There are a museum, statues, and historical buildings within walking distance and also a lake at the campground. We did lots of walking and a little bit of shopping. Squirrels were busy the whole time right outside our door so the cat was entertained nicely. I was still 2 days early for the Myrtle Beach reservation so we booked 2 nights at Huntington Beach State Park. Lots to do there but don’t book the south campground, definitely book the north campground. I hated our spot and the whole area but when walking toward the office buildings and then the other campground, it completely changed in atmosphere. Lots of nature here if you like bird watching or walking through the swamp (on a boardwalk of course!). Checked in to Apache Pier Family Campground in Myrtle Beach on October 20 and we stayed until November 12. Lovely place, a little dated but I like it that way. Lots of permanent residents. I enjoyed the onsite pier restaurant 3 times while there and had a rental car for part of the time. Highlights — Carolina Opry, Medieval Times Dinner Show, Ripley Aquarium, Barefoot Landing. Lots and lots of walks on the beach and met some nice people. Cheaper if you pay for a month rather than weekly because after about 21 days, you aren’t losing money if you leave early. I wanted to stay in Myrtle Beach as long as possible but needed to be back in Sacramento before Thanksgiving as I promised family I would be there. I figured out 6 days driving and 1 day of leeway just in case so we left our beloved Atlantic Ocean on the morning of Nov. 12. Night 3 — 505 miles. Decided no more free overnights on this trip. Stayed at Flatonia Ranch RV park, west of Houston. Will NEVER drive through a big city again if I can help it. Night 4 — 518 miles. Still in Texas! Stayed at the Van Horn RV Park, a former KOA. Liked it here. Very nice little home style cafe that delivers to your motorhome. Would stay again. Night 5 — 390 miles (I was getting tired). Benson KOA in Arizona. This was a fun, although a little dated, KOA and I would stay here again. Night 7 — 420 miles. Stayed at the Visalia KOA and only 203 miles from “home.” Nice dog park and visited with a woman who lives there full time and has a dog. She was walking her dog before heading off to work. (No pictures during this stay). Day 8 — arrival at the family’s, Sacramento, CA and check in at Cal Expo RV Park for an extended stay. Next new RV Park report will be in 2019!